Yeah, yeah, yeah for Christmas we should all be asking for peace on Earth, but let’s pretend for one second that it’s not taboo to admit that you want material things under the tree come December 25th. As a college student, everyone is always asking me the dreaded question, “What do you want for Christmas?” The truth is, it’s hard to think of wish list items sometimes so if you’re grandmother is pressing you for answers, here are some ideas for your Christmas list. There’s no better gift than an ever lasting memory right? If your plan is to take off for somewhere tropical come March, consider asking for “spring break money”. Grandparents like to give it because they know what it’s going to, plus it will take the pressure off when it comes to saving every cent for break. A new trend in apartment décor, Christmas lights will liven up any room and set a peaceful atmosphere. Plus as the Christmas season wanes on they get cheaper. You’re in college now. If you don’t get excited over cheap furniture, cool lighting, and lingonberry juice then what kind of adult are you? Ikea is like Disney World for 20 somethings. Decorate your apartment, eat some Swedish meatballs, and carry home a box of delicious lingonberry concentrate all on a family member’s dime this holiday season. Once again, this is a gift that would seem horribly boring ten years ago, but nowadays Costco is the promise land. You need 200 Pizza Bagel Bites. You’re a busy person. Plus if you’re hungry, tasting stations equal free lunch. Slushie makers will be there for yo as you pull those dreadful all-nighters studying for finals. They also are great at parties. The most versatile thing you could ever own. Yeah you could use microwavable bags, but popcorn kernels are cheaper and the whole process is better for you. Plus you can play with a million flavors. There are whole recipe books on how to make new and delicious kinds of popcorn. It’s the gift that keeps on giving. Still ask for world peace though. We do need that. -Pour in hot chocolate mix first. 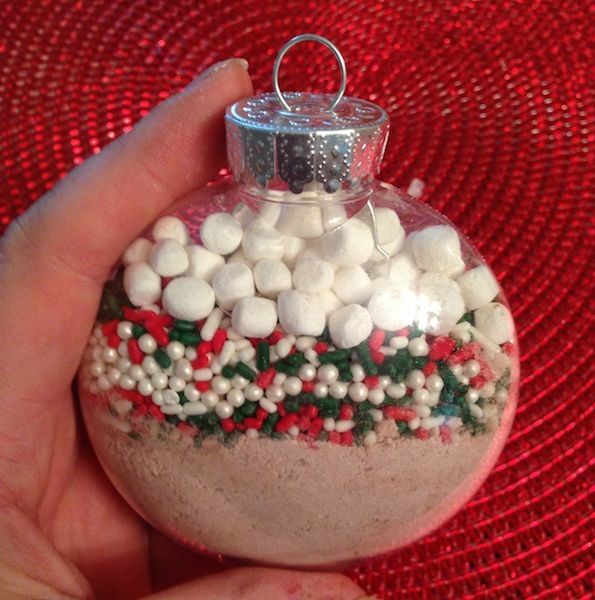 -Lastly add the marshmallows to fill up the ornament. These cute crafts make excellent stocking stuffers or just small gifts for friends, co-workers, or neighbors. 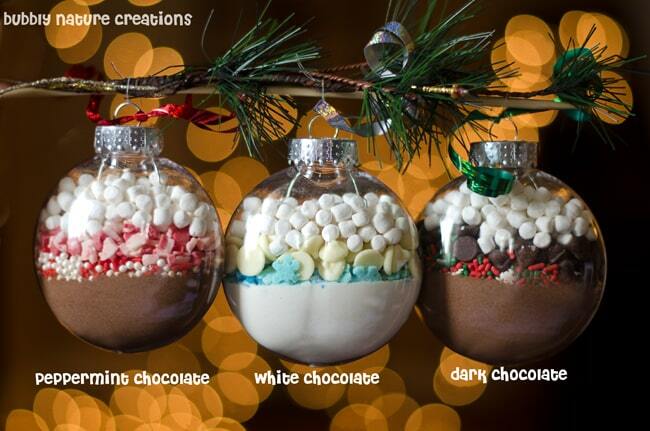 Bonus: Dip candy canes in chocolate and give with the ornaments as delicious hot chocolate stirs. Mason jars have become popular at weddings, parties, and now they can become part of your holiday décor. While there are several different ways to decorate a mason jar for Christmas, here is how to make the Snowman. -While jar dries, start making the earmuffs. -Cut one red and one white pipe cleaner in half and twist them together. Once twisted mold into a “U” shape. -Glue pom poms, one on each side of the lid of the jar. These cute jars make excellent gifts or just a cute DIY decoration. Click on the link in the title for more patterns for your jar. Bonus: put a flameless LED candle inside your jar to make it glow. Nothing beats the Christmas season. Baking cookies, drinking hot chocolate, listening to Christmas music, watching Christmas movies- it’s almost impossible to be in a bad mood. But ABC Family’s supposed “25 Days of Christmas” can sometimes put me in one. Every year ABC Family advertises that they will be playing Christmas movies for the entirety of the twenty-five days leading up to Christmas. This is a great concept. Who doesn’t want to huddle around in the living room watching classic movies? Unfortunately, it’s too good to be true. Don’t believe me? Simply watch a commercial for the monstrosity. ABC Family advertises the Harry Potter movies, Pixar movies, made for TV movies about dancing…all of this is included in that supposed “25 Days of Christmas”. It’s almost as if they think that advertising “The Incredibles” with some snowflakes in the corner of the television screen and some vague sleigh bells in the background will make it a Christmas movie. Now on one hand I get it, they probably feel like if they solely show Christmas movies then they’ll isolate their viewers who don’t celebrate the holiday. But they advertise the event as the “25 Days of CHRISTMAS” so they’re isolating the minority of viewers that don’t celebrate it by calling it the “25 Days of Christmas”. Honestly, other channels such as Hallmark and Lifetime show nothing but Christmas movies during the holidays and if anyone should be worried about losing viewers, it’s those channels since they only have about twenty to begin with. 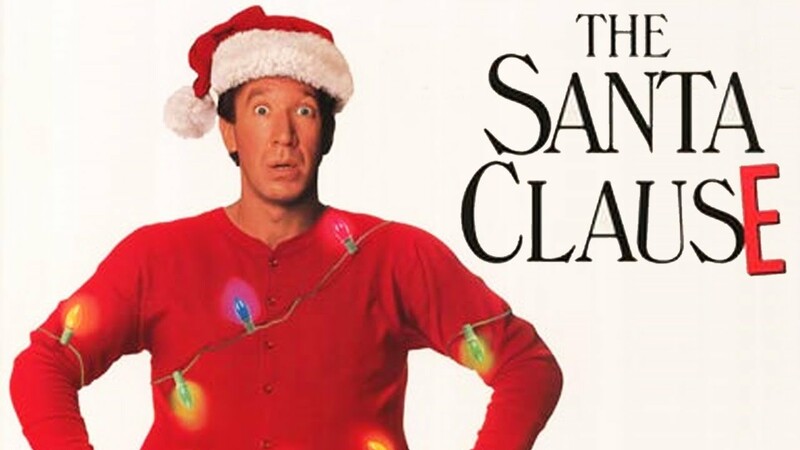 There’s nothing wrong with this non-Christmas movies. After all, both Harry Potter and Disney are delightful. But it’s hard to get into the holiday spirit with some holiday movies when holiday movies are not being played despite being advertised. Then when ABC Family does get around to playing some actual Christmas movies, they play the same handful of movies each night. More Christmas movies exist then Jim Carrey’s version of “How The Grinch Stole Christmas”. All of that being said, ABC Family’s “25 Days of Christmas” is a time honored family tradition in many households and it’d be sad if they stopped doing it. But for God’s sake, if you’re going to play Christmas movies for a month then PLEASE just play Christmas movies for a month. Starbucks loves fall and the holidays. During the fall, everyone trips over themselves to get their paws on a Pumpkin Spice Latte. During the winter, everyone loses their mind over the delicious peppermint mocha. Every year, Starbucks gets in the holiday spirit by decorating their famous white cups with their logo in red. In the past, the red has been accompanied by traditional symbols of Christmas such as a cute penguin ice skating, snowflakes and Christmas trees. This year, however, Starbucks opted for a cozy, minimalist style of just plain red. And so started what I will call the Starbucks Holiday Cup Fiasco of 2015. Although my Facebook demographic consists of mostly left-wingers, there was a notable outrage over the lack of Christmas cheer appearing on Starbucks cups on November 1st. As usual, radical Christians are citing this as part of their made-up War on Christmas. Black Friday, in the past, has started the morning after Thanksgiving. In recent years, it’s started as early as Thanksgiving morning. Nice things are also hard to come by because people, specifically radical Christians, take any respect for other religions as disrespect for their own. Starbucks hasn’t even made any public announcement stating that they have traded their usual holiday cups for warm red ones in order to be “politically correct.” Besides the obvious Christmas symbols being absent, red itself is still a Christmas color. However, radical Christians are always on the lookout for signs that the world doesn’t love Jesus and that there’s a war on not only Christmas but Christianity. I find it ironic that many times, these Christians who are getting up-in-arms over a paper coffee cup, are the same people who laugh in the face of other groups when they have blatantly been discriminated against. Some of these same Christians who think Starbucks has an anti-Christian agenda are the same people who support a historically racist symbol. Overall the idea of a War on Christmas is what’s really ruining the idea of Christmas for me. Because people take a silly holiday so seriously, it’s made me take it less seriously. If we could all just get along, stop reading into everything and taking it as a personal attack then maybe–just maybe–we could have nice things. I’ve been babysitting for almost a decade, and over the years I’ve been lucky enough to work with exceptionally bright and fascinating children. I was only 11 when I started working — in retrospect, just a kid myself — and have never really gotten past a distinct feeling of camaraderie with all of my young charges. I don’t pretend to understand every four-year-old’s whims (or the average preteen’s preoccupations), but I do have a certain sympathy with my kids’ complaints and struggles.